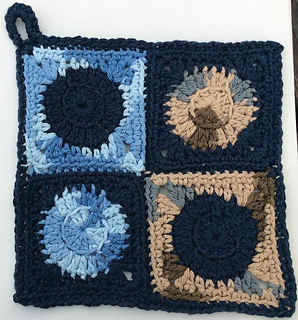 Potholder: 7.5” (19 cm) square. 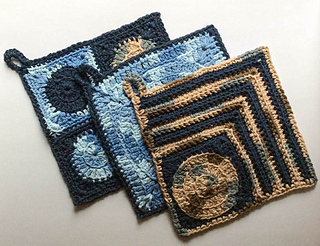 This is one of 3 potholders featuring circle motifs. This one is made of four, joined motifs. 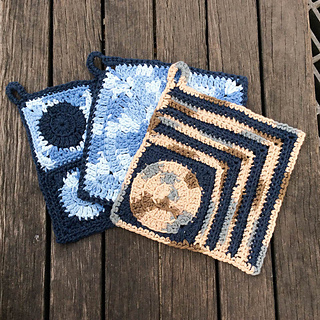 Instructions are also included for granny square versions without the hanging loop. This pattern is available for FREE on my blog here. The free version is supported by advertising on my website. The downloadable PDF for sale on Ravelry includes the full pattern in one printable file without advertisements. Lily Sugar’n Cream yarn (100% cotton, 2.5 oz/71 g/120 yd/110 m) – 1 skein in Indigo (CA). Lily Sugar’n Cream yarn (100% cotton, 2 oz/57 g/95 yd/87 m) – 1 skein ea in Faded Denim (CB) and Earth Ombre (CC). US Size H-8 (5 mm) crochet hook, or size needed to obtain gauge. Finished Potholder = 7.5” (19 cm) square in pattern. Exact gauge is not critical for this project, but stitches should be tight so potholders can protect hands and surfaces from heat.